Retrieve data without writing SQLs. Minimum work to use Hibernate (ORM) by designing and generating the persistable tier. SQL can be difficult to code and debug, and will only become more difficult as your schema and business logic become more complicated. Ever thought of manipulating database without writing a line of SQL? Our Object Relational Mapping (ORM) tool lets you achieve this. Simply design database with our ERD tool (or to reverse engineer an ERD from the existing database). Then, generate Hibernate ORM mapping tier from the ERD, and that's it! The generated object library allows you to access and manipulate database records entirely with pure Java objects. Bye SQL! Forget the time and effort it takes to write and debug SQL. From now on, you can access database via persistable objects generated from ERDs and the NHibernate framework. Enjoy elegant coding - no more SQL, no more pain! Perform visual modeling and programming within a unified environment - your favorite IDE. Design system and database with class diagram and ERD, generate the persistable classes and program in the IDE. No switch between windows, no SQL, no hassle! 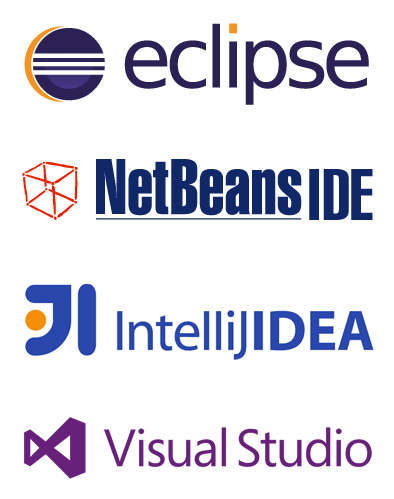 Elevate your software development experience to a new level through its seamless integration with Eclipse, Visual Studio, NetBeans, IntelliJ IDEA and Android Studio. Generate class diagram from ERD and synchronizing changes between them, and vice versa. 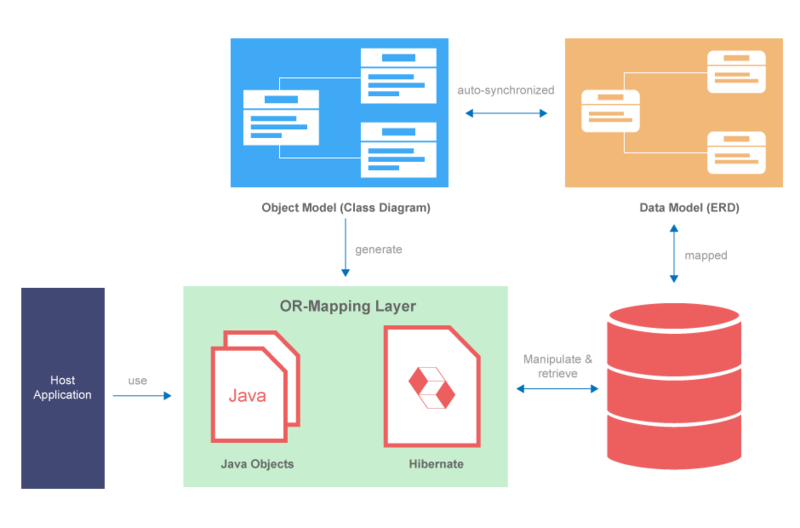 Object-relational mapping diagram (ORM diagram) presents the mapping between classes and entities visually. Generate Hibernate ORM code from an existing database. Allow specifying how mapping information is to be stored. Allow specifying how error is being handled when occur. Allow specifying how exception is being handled when occur. Reduce database loading. Avoid objects from being loaded when the main object is loaded with the 'lazy' option. Allow specifying the behavior of update when updating a bi-directional association. Allow specifying the way objects can be retrieved with generated code. Improve performance by configuring second level cache. Include optional libraries and JDBC drivers in generated orm.jar. Generate sample files that teaches you how to work with the generated code. Generate Java Server Page (JSP) sample. Automatically form the ORM persistence model from generated Hibernate mapping files.